I haven’t had much from Southeast Asia and I’ve never had pho from a Vietnamese cafe, only from American cafes. We do have a “Little Saigon”, so to speak, in Salt Lake, but honestly, I haven’t had much occasion to trek down there and try the establishments. But, I did stop at a little market there a while back and picked up some rice stick noodles for some future dish — looks like it was my lucky day to mix ’em up! My homemade chicken stock, like all of my stocks, was very lightly salted, almost to the point of being unsalted. I do this because if I want to reduce one of my stocks for a sauce, I don’t want it to be oversalted at the end. It also gives me more room to play with how I want that salt to be added. In this case, I opted for soy sauce to bring the needed salt and add a bit more flavor. I’ll be honest, though. I didn’t have high hopes for this recipe at first. You see, it combines two flavors my husband absolutely hates: ginger and anise. He was a good sport about it and willing to try it. I promised him a pizza if he hated it (he demurred and said he’d cook something up for himself if he couldn’t eat it). But when I tasted the broth, it didn’t taste overwhelmingly gingery. It tasted really good — which my husband confirmed! We weren’t given much license to play around with this, though I still managed a few little tweaks. 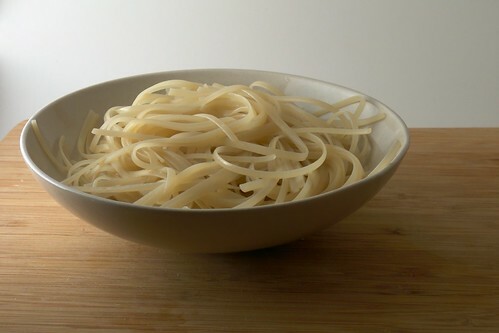 :) I admit I didn’t use anywhere near the quantity of noodles she called for because there’s just only so many noodles I can handle. The other half of the challenge, where we had full rein to play will be posted shortly. Heat a frying pan over medium heat. Add the coriander seeds, cloves and star anise and toast until fragrant, about 3-4 minutes. Immediately remove. Add the chicken and lightly brown it. In a large pot, add the chicken, stock, spices, onion, ginger, sugar, soy sauce and fish sauce, then bring to a boil. Reduce the heat to medium-low and let simmer for 20 minutes, skimming if necessary. Taste. Use tongs to remove the chicken breasts and shred the meat with your fingers, discarding the bone if you have used bone-in breasts. Taste the broth and add more fish sauce or sugar, if needed. Strain the broth and discard the solids. 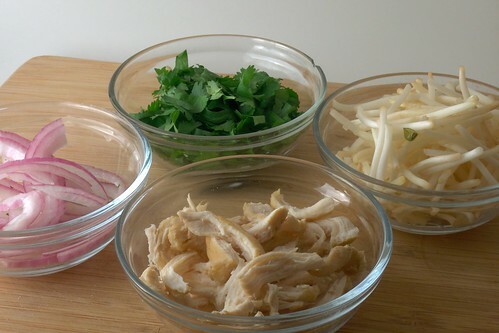 Ladle the broth into bowls then divide the shredded chicken breast and the soft noodles evenly into each bowl. 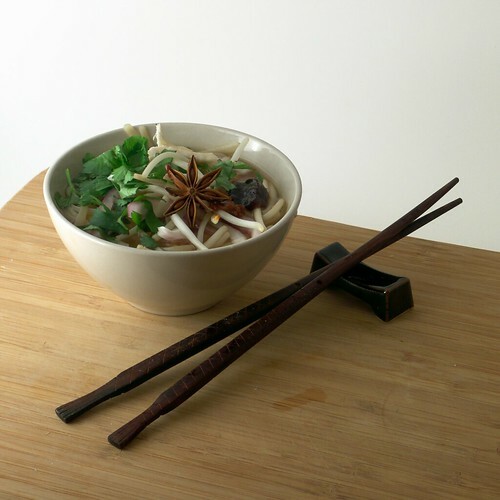 This entry was posted in asian, chicken, dairy-free, daring cooks, gluten-free, recipes, soup, untranslated. Bookmark the permalink. 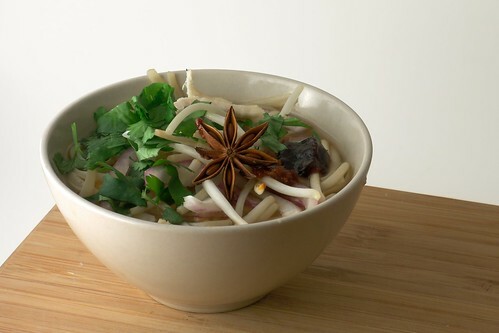 Beautiful Pho and stunning pictures! Catherine: Thanks! If I had had enough chicken broth left over from that night, we would have done the same thing! Pingback: The Kitchen Mouse » Happy Anniversary to us!